You may know them for their quaint, yellow farm stand that fronts Kamehameha Highway, a busy route that is paraded by tourists seeking a taste of the road’s famed shrimp trucks. With its homey feel, diverse crop selection and dedication to making agriculture fun for everyone, Kahuku Farms has long been a staple in North Shore’s farming community. 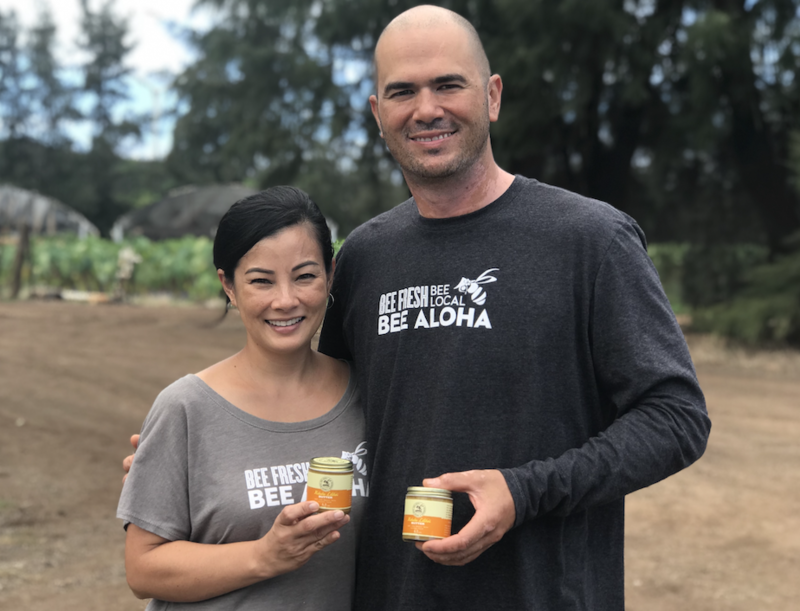 Farm Manager Kylie Matsuda-Lum, her husband Judah Lum and sister Kalyn Matsuda are the fourth generation of growers on the land that Kahuku Farms sits on. Its history dates back to the early 1900’s, when two families, the Matsudas and the Fukuyamas, migrated from Japan to work in the sugar plantations and eventually started their own farms. It wasn’t until 1986 when the families joined forces to establish the Kahuku Brand, a wholesale company of local fruits and vegetables. Later In 2010, nearly five acres of the land was designated to expand agritourism, thus establishing Kahuku Farms, a destination where the public can experience the families’ love of food and gain a deeper understanding of Hawaii’s farming industry. However, as with many farms, Kahuku often battled with producing too much “ugly fruit” that did not meet the selective purchasing standards of the market. They found that these products – particularly their bananas – were at risk of going to waste, despite its identical (if not better) taste. To create a suitable marketplace for these items, Kylie and her team decided to open their signature farm-to-table café in 2010. There, the imperfect fruits and vegetables are rescued and put to use in mouth-watering smoothies, garden-fresh salads and hand-crafted sandwiches. “Diversifying our operation was critical moving forward. The idea was for us to capture a portion of this farm and section it off for education and value-adding,” Judah shared. Today, Kahuku Farms remains deeply ingrained in sharing the bounty of diversified farming with the local community and creating hands-on, educational opportunities that shed a new light on agriculture. Families can visit the farm, learn how certain local ingredients are grown and experience agriculture firsthand at the popular farm-to-table café. 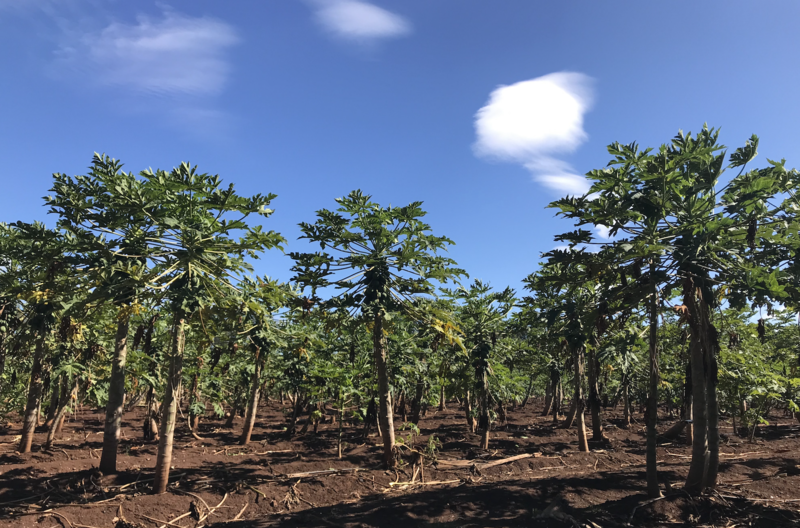 Outside of its commercial agro-tourism business, the farm continues to grow in-demand crops, including Lāʻie gold papaya, apple bananas, long eggplant and luau leaf, and sell at farmers’ markets like the KCC Farmers’ Market or directly to wholesalers. To take a wagon tour or learn more about what you can experience at Kahuku Farms, visit www.kahukufarms.com.